What Does It Mean When Your Bearded Dragon Wiggles? Whether you bring a stray cat or a bearded dragon (genus Pogona) into your home, it probably won't take too long to notice the often adorable typical behaviors and quirks of said cutie. Wiggling behavior is a common sign of a young -- and hungry -- bearded dragon. Animals across the board are usually pretty fond of eating, to say the least, and bearded dragons aren't anomalous here. Youthful bearded dragons are especially exuberant and eager in showing their happiness about eating. Once the lively lizards identify their prey, they get ready to go after them by doing a lot of conspicuous wiggling and stretching out of their necks. After they're done getting ready, they swiftly dive toward their food. If you notice your bearded dragon in a wiggling frenzy before dinner, he's probably just a little excited -- just as he'd be out in nature before going in for his prey. 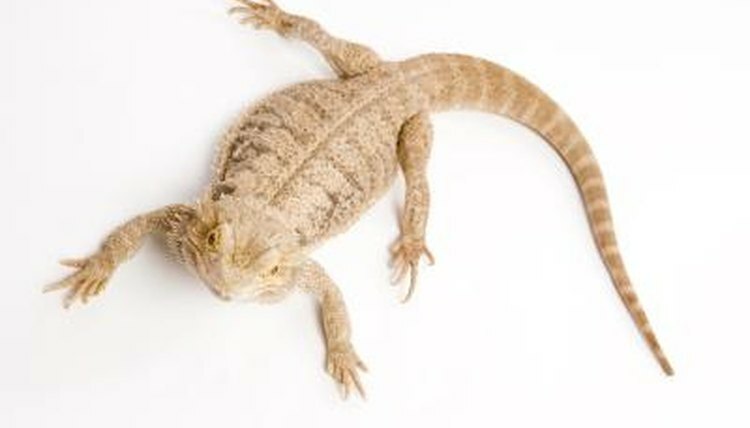 Although wiggling often signifies a young bearded dragon, adults are just as serious about eating. They tend to approach eating by rapidly forcing their bodies into the direction of their prey, all while their mouths are totally wide open. Insects are common prey animals that regularly make juvenile bearded dragons wiggle with joy. Insects are beneficial for encouraging their proper development. As bearded dragons get older, they're often fed things that are a little bigger, such as pinky mice. Fresh vegetables are also an important element of a developing bearded dragon menu, as long as they're cut up into small and manageable bits. Some examples of veggies that are appropriate for these lizards include collard greens, carrots and romaine lettuce. Work with a reptile veterinarian to set up a nutritious meal plan for your bearded dragon. Wiggling sometimes can signify illness in bearded dragons, which is why annual checkups with the veterinarian are imperative. If you notice unusual twitching behavior in your bearded dragon, regardless of his age and regardless of whether it's mealtime, schedule an appointment with the vet promptly. Twitching can indicate a wide array of ailments in bearded dragons, including both metabolic bone disease and the infection atadenovirus. Twitching also frequently denotes seizures, which can be related to anything from injury to liver disease. Oklahoma State University Center for Veterinary Health Services: Is a Bearded Dragon a Good Pet? What Do Domestic Mice Eat? Do Guinea Pigs Need to Go to a Vet?